Has happiness become a modern straitjacket? Is there a small madman lurking in you? Would it be sometimes good to be honestly jealous? The popular narrtive non-fiction title Gentle But Firm is not a traditional self-help book, but it is a great counterweight to any self-help guides giving the reader tips on perfection and on superior performance. Gentle But Firm challenges the readers to do a self-reflection, providing tools for analysing one’s own way of life. How to find the difficult balance in between being firm and being gentle? Both are needed in any human interaction. Readers have found comfort in Kallio’s wise and well-thought-out writing, allowing us to accept our own limits and our discomfort. Gentle But Firm has been one of WSOY’s recent success stories with over 30.000 copies sold in Finland! In 2018, WSOY published a workbook entitled Gentle but Firm. A Workbook for Your Mind in which the readers may note their own feelings and be guided towards a good and a meaningful life. Maaret Kallio has the training of a congnitive analytic psychotherapist and a she is a specialist in sexological counselling (NACS). She is also an author to a popular column in Helsingin Sanomat, Finland’s national daily newspaper. 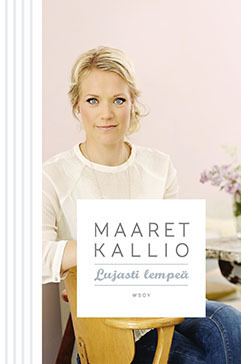 Kallio has authored several acclaimed non-fiction books e.g. on relationships, parenting and sexuality.